As a contractor, you’re a Jack of Many Trades, and you’re well-connected within the home improvement and fix-it communities. These are great attributes that can lead to success, especially when you consider that many of your customers have more than a single need when they call upon you to help them with their homes. Contractor cross-selling can absolutely boost your bottom line, but it’s important to adhere to a few guidelines before going rogue on your customer base. When you approach the opportunity correctly, you could win plenty of business for your company. Helpful Add-Ons are More Effective than Hard Sells. Consumers are wise to the game when it comes to overly ambitious sales people. Avoid telling people they need additional services. Instead, suggest solutions for the future. Often, customers who are aware of their homes’ needs will be receptive to the idea of a win/win situation since you’ve already established a relationship. If the homeowner was unaware of the potential problems you’ve pointed out, you’ll be top of mind when it’s time to make the fix. If you are pushy during the contractor cross-selling experience, you’ll push yourself right out the front door. Be Timely with Your Advice. Timing is everything, and in the world of contracting, seasonal suggestions can bring big wins when it comes to cross-selling. Were you hired to prevent ice dams? Remind the homeowners that chimney maintenance is just as important, or suggest they call you when the weather warms up for a full roof inspection. Offer Your Expertise while You’re Onsite. If your customer seems interested in additional services, offer to take a look at the situation while you’re there at no charge, and be honest about your findings. A free analysis of the situation saves the homeowner time and money, and it helps reinforce your relationship. Follow-up with Relevant Information. Make sure you have a system in place to not only send relevant information based on customer needs, but keep in touch with your customer database. By having a regularly scheduled customer communication program, you will be remembered. 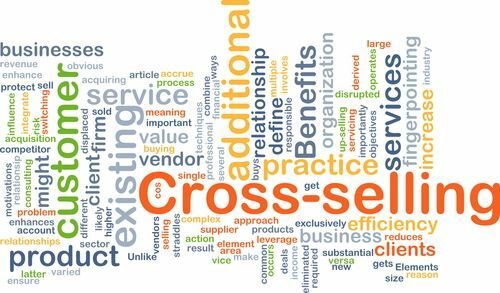 What cross-selling techniques have you used to enhance your company’s bottom line?